Here is a gift that will wow any fly fisherman (Or angler in general) and capture the essence of the sport they love. Authentic details abound; the pen top features a traditional open spooled fly fishing reel with detailed fly line on the spool. Below the reel is a cast, engraved trout thatÕs caught and fighting in the fly line. The pen clip is a fly fishing rod that you can align below the trout to replicate the trout fighting in the line and capture the feel of the fight as you reel the trout in. Finally, the pen tip features a beautiful 360-degree outdoors scene of a lone fisherman casting his line in front of an intricately detailed mountain backdrop. 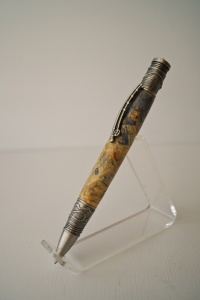 The pen is dressed in a piece of box elder burl dyed to remind one of a mountain stream with snocapped mountains. The pen accepts a parker style refill for a smooth consistent writing experience.